Anschluss (German: [ˈʔanʃlʊs], "connection" or "joining") was the Nazi propaganda term for the annexation of Austria into Nazi Germany in March 1938. German spelling, until the German orthography reform of 1996, was Anschluß and it was also known as the Anschluss Österreichs ( pronunciation , German: Austrian Annexation). The 1938 Anschluss stands in contrast to the Anschluss movement (Austria and Germany united as one country to form a "Greater Germany"). [lower-alpha 1] In 1918, the Republic of German-Austria attempted union with Germany, but the Treaty of Saint Germain (10 September 1919) and the Treaty of Versailles (28 June 1919) forbade both the union and the continued use of the name "German-Austria" (Deutschösterreich). The Austro-Prussian War of 1866 had resulted in the dissolution of the 19th-century German Confederation, a loose association which had included Austria and the various independent German monarchies, such as Prussia and Bavaria. Austria was annexed by the Third Reich on 12 March 1938. There had been several years of pressure from supporters in Austria and Germany (both Nazis and non-Nazis) for the "Heim ins Reich" movement. Earlier, Nazi Germany had provided support for the Austrian National Socialist Party (Austrian Nazi Party) in its bid to seize power from Austria's Fatherland Front government. Nevertheless, the German Führer underestimated his opposition. Schuschnigg did resign on the evening of 11 March, but President Wilhelm Miklas refused to appoint Seyss-Inquart as Chancellor. At 8:45 pm, Hitler, tired of waiting, ordered the invasion to commence at dawn on 12 March regardless. 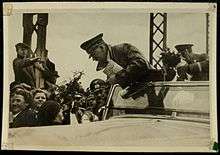 Around 10 pm, a forged telegram was sent in Seyss-Inquart's name asking for German troops, since he was not yet Chancellor and was unable to do so himself. Seyss-Inquart was not installed as Chancellor until after midnight, when Miklas resigned himself to the inevitable. As Pulitzer Prize-winning journalist Edgar A Mowrer, reporting from Paris for CBS, observed: "There is no one in all France who does not believe that Hitler invaded Austria not to hold a genuine plebiscite, but to prevent the plebiscite planned by Schusschnigg from demonstrating to the entire world just how little hold National Socialism really had on that tiny country." Clearly it was Hitler, and not Schuschnigg, who was terrified by the potential results of the scheduled plebiscite, and that was the best indication of where Austrians' loyalty lay. 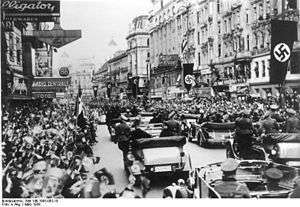 The newly installed Nazis, within two days, transferred power to Germany, and Wehrmacht troops entered Austria to enforce the Anschluss. 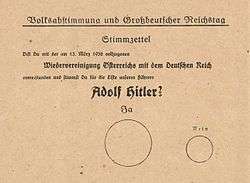 The Nazis held a controlled plebiscite (Volksabstimmung) in the whole Reich within the following month, asking the people to ratify the fait accompli, and claimed that 99.7561% of the votes cast in Austria were in favor. Austrian citizens of Jewish origin were not admitted to the plebiscite. The Anschluss was among the first major steps in Hitler's creation of a Greater German Reich that was to include all ethnic Germans and all the lands and territories that the German Empire had lost after the First World War. Although Austria had never been a part of 20th-century Germany (the unification of Germany in the 19th century created a Prussian dominated nation state in 1871, leaving Austria outside of "Lesser Germany"), it was the logical next target. Prior to invading Austria in 1938, the Third Reich had remilitarized the Rhineland, and the Saar region was returned to Germany after 15 years of occupation through a plebiscite. After the Anschluss, Hitler targeted Czechoslovakia, provoking an international crisis which led to the Munich Agreement in September 1938, giving the Third Reich control of the industrial Sudetenland, which had a predominantly ethnic German population. In March 1939, Hitler then dismantled Czechoslovakia by recognising the independence of Slovakia and making the rest of the nation a protectorate. That same year, Memelland was returned from Lithuania. The idea of grouping all Germans into a nation-state country had been the subject of debate in the 19th century from the ending of the Holy Roman Empire until the ending of the German Confederation. By 1871, the decision was to form a "kleindeutsch" German Empire based on Prussia and excluding Austria. Austria had its own empire at the time, comprising Hungarians, Slavs and other ethnic groups ruled by a German minority. Austria had wanted a Großdeutsche Lösung (greater Germany solution), whereby the German states would be united under the leadership of the Austrian Germans (Habsburgs). This solution would include all the German states (including the non-German regions of Austria), but Prussia would have to take second place. This controversy, called dualism, dominated Prusso-Austrian diplomacy and the politics of the German states, for the next 20 years. Elite and popular opinion in Austria after 1918 largely favored some sort of union with Germany, but it was explicitly forbidden by the peace treaties. 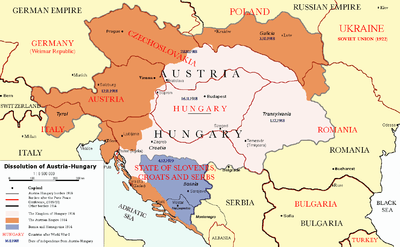 The Austro-Hungarian Empire broke up in 1918, and on 12 November that year German Austria was declared a republic. The provisional national assembly drafted a provisional constitution that stated that "German Austria is a democratic republic" (Article 1) and "German Austria is a component of the German Republic" (Article 2). Later plebiscites in the German border provinces of Tyrol and Salzburg yielded majorities of 98% and 99% in favor of a unification with the German Republic. The Treaty of Versailles and the Treaty of Saint-Germain (both signed in 1919) explicitly prohibited the political inclusion of Austria in the German state. This measure was criticized by Hugo Preuss, the drafter of the German Weimar Constitution, who saw the prohibition as a contradiction of the Wilsonian principle of self-determination of peoples, intended to help bring peace to Europe. Following the destruction of World War I, however, France and Britain feared the power of a larger Germany and had begun to disempower the current one. Austrian particularism, especially among the nobility, also played a role in the decisions; Austria was Roman Catholic, while Germany was dominated by Protestants, especially in government (the Prussian nobility, for example, was Lutheran). The constitutions of the Weimar Republic and the First Austrian Republic included the political goal of unification, which was widely supported by democratic parties. In the early 1930s, popular support in Austria for union with Germany remained overwhelming, and the Austrian government looked to a possible customs union with German Republic in 1931. When the Nazis, led by Adolf Hitler, rose to power in the Weimar Republic, the Austrian government withdrew from economic ties. Hitler, a German Austrian by birth,[lower-alpha 2] picked up his German nationalist ideas while serving in the German Army during World War I. One of the Nazis' aims was to re-unite all Germans either born or living outside of the Reich to create an "all-German Reich". Hitler had written in his 1924 autobiography (Mein Kampf) that he would create a union between his birth country and Germany by any means possible ("German-Austria must be restored to the great German Motherland." "People of the same blood should be in the same Reich."). Austria shared the economic turbulence of the Great Depression, with a high unemployment rate, and unstable commerce and industry. During the 1920s it was a target for German investment capital. 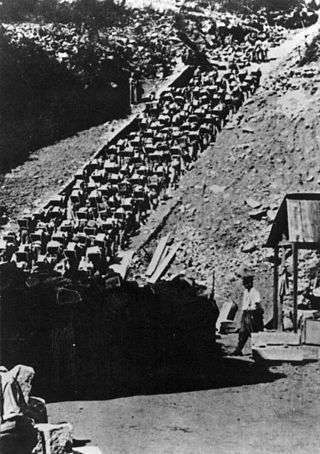 By 1937 rapid German rearmament increased Berlin's interest in annexing Austria, rich in raw materials and labor. It supplied Germany with magnesium and the products of the iron, textile and machine industries. It had gold and foreign currency reserves, many unemployed skilled workers, hundreds of idle factories, and large potential hydroelectric resources. Power was centralized in the office of the chancellor, who was empowered to rule by decree. The dominance of the Christian Social Party (whose economic policies were based on the papal encyclical Rerum novarum) was an Austrian phenomenon. Austria's national identity had strong Catholic elements that were incorporated into the movement, by way of clerical authoritarian tendencies not found in Nazism. Engelbert Dollfuss and his successor, Kurt Schuschnigg, turned to Italy for inspiration and support. The statist corporatism often referred to as Austrofascism bore more resemblance to Italian Fascism than to German National Socialism. The Austrian Nazi Party failed to win any seats in the November 1930 general election, but its popularity grew in Austria as Austrian-born Hitler came to power in Germany. The idea of the country joining Germany also grew in popularity, and Anschluss might have occurred by democratic process had Austrian Nazis not begun a terrorism campaign. John Gunther wrote in 1936, "In 1932 Austria was probably eighty percent pro-Anschluss." When Germany permitted residents of Austria to vote on March 5, 1933, three special trains, boats and trucks brought such masses to Passau that the SS staged a ceremonial welcome. By the end of 1933, Austrian public opinion about German annexation was at least 60% against. "Reason: the Hitler terror". On 25 July 1934, Dollfuss was assassinated by Austrian Nazis in a failed coup. Afterwards, leading Austrian Nazis fled to Germany but they continued to push for unification from there. The remaining Austrian Nazis continued terrorist attacks against Austrian governmental institutions, causing a death toll of more than 800 between 1934 and 1938. Dollfuss' successor was Kurt Schuschnigg, who followed a political course similar to his predecessor. In 1935 Schuschnigg used the police to suppress Nazi supporters. Police actions under Schuschnigg included gathering Nazis (and Social Democrats) and holding them in internment camps. The Austrofascism of Austria between 1934–1938 focused on the history of Austria and opposed the absorption of Austria into the Third Reich (according to the philosophy Austrians were "better Germans"). Schuschnigg called Austria the "better German state" but struggled to keep Austria independent. By 1936 the damage to Austria from the German boycott was too great. That summer Schuschnigg told Mussolini that his country had to come to an agreement with Germany. In July 1936 he signed an agreement with Germany's Franz von Papen, in which Schuschnigg agreed to the release of Nazis imprisoned in Austria and Germany promised to respect Austrian sovereignty. This did not satisfy Hitler and the pro-Germany Austrian Nazis grew in strength. Seyss-Inquart was a long-time supporter of the Nazis who sought the union of all Germans in one state. Leopold argues he was a moderate who favoured an evolutionary approach to union. He opposed the violent tactics of the Austrian Nazis, cooperated with Catholic groups, and wanted to preserve a measure of Austrian identity within the Third Reich. One week later, Hitler made a speech in which he stated, "The German Reich is no longer willing to tolerate the suppression of ten million Germans across its borders." This was clearly directed at Austria and Czechoslovakia. On 9 March 1938, in an effort to preserve Austria's independence, Schuschnigg scheduled a plebiscite on the issue of unification for 13 March. To secure a large majority in the referendum, Schuschnigg dismantled the one-party state. He agreed to legalize the Social Democrats and their trade unions in return for their support in the referendum. He also set the minimum voting age at 24 to exclude younger voters because the Nazi movement was most popular among the young. The plan backfired when it became apparent that Hitler would not stand by while Austria declared its independence by public vote. Hitler declared that the referendum would be subject to major fraud and that Germany would not accept it. In addition, the German ministry of propaganda issued press reports that riots had broken out in Austria and that large parts of the Austrian population were calling for German troops to restore order. Schuschnigg immediately responded that reports of riots were false. Hitler sent an ultimatum to Schuschnigg on 11 March, demanding that he hand over all power to the Austrian Nazis or face an invasion. The ultimatum was set to expire at noon, but was extended by two hours. Without waiting for an answer, Hitler had already signed the order to send troops into Austria at one o'clock. Schuschnigg desperately sought support for Austrian independence in the hours following the ultimatum. Realizing that neither France nor Britain was willing to offer assistance, he resigned as chancellor that evening. In the radio broadcast in which he announced his resignation, he argued that he accepted the changes and allowed the Nazis to take over the government 'to avoid the shedding of fraternal blood [Bruderblut]'. Seyss-Inquart was appointed chancellor after midnight on 12 March, hours after a forged, predrafted telegram requesting that German troops enter Austria to help restore order was sent, since Seyes-Inquart was unable at that time to send it himself. 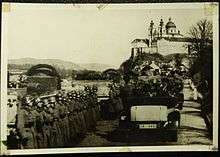 Kloster Melk on the River Donau (Danube) / Austria 1938 - Hitler's motorcade travel's along the Danube River in Austria in 1938. Visible in the background is Melk Abby (Kloster Melk). From the private collection of H. Blair Howell. Hitler's car crossed the border in the afternoon at Braunau, his birthplace, with a 4,000 man bodyguard. In the evening, he arrived at Linz and was given an enthusiastic welcome. The enthusiasm displayed toward Hitler and the Germans surprised both Nazis and non-Nazis, as most people had believed that a majority of Austrians opposed Anschluss. 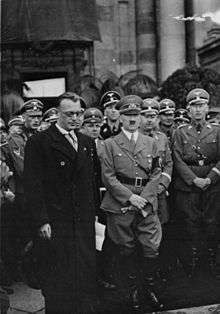 Hitler had intended to leave Austria as a puppet state with Seyss-Inquart as head of a pro-Nazi government. However, the overwhelming reception caused him to change course and absorb Austria into the Reich. On 13 March Seyss-Inquart announced the revocation of Article 88 of the Treaty of Saint-Germain, which prohibited the unification of Austria and Germany, and approved the replacement of the Austrian states with Reichsgaue. The seizure of Austria demonstrated once again Hitler's aggressive territorial ambitions, and, once again, the failure of the British and the French to take action against him for violating the Versailles Treaty. Their lack of will emboldened him toward further aggression. 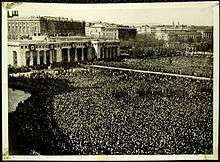 Hitler's journey through Austria became a triumphal tour that climaxed in Vienna on 15 March 1938, when around 200,000 cheering German-Austrians gathered around the Heldenplatz (Square of Heroes) to hear Hitler say that "The oldest eastern province of the German people shall be, from this point on, the newest bastion of the German Reich" followed by his "greatest accomplishment" (completing the annexing of Austria to form a Greater German Reich) by saying "Als Führer und Kanzler der deutschen Nation und des Reiches melde ich vor der deutschen Geschichte nunmehr den Eintritt meiner Heimat in das Deutsche Reich." Translation: "As leader and chancellor of the German nation and Reich I announce to German history now the entry of my homeland into the German Reich." Hitler later commented: "Certain foreign newspapers have said that we fell on Austria with brutal methods. I can only say: even in death they cannot stop lying. I have in the course of my political struggle won much love from my people, but when I crossed the former frontier (into Austria) there met me such a stream of love as I have never experienced. Not as tyrants have we come, but as liberators." 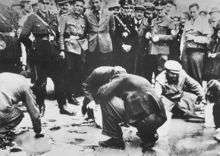 Immediately after the Anschluss, Vienna’s Jews were forced to wash pro-independence slogans (de:Reibpartie) from the city’s pavements. The campaign against the Jews began the day after the Anschluss. They were driven through the streets of Vienna, their homes and shops were plundered. Jewish men and women were forced to wash away pro-independence slogans painted on the streets of Vienna ahead of the failed 13 March plebiscite. Jewish actresses from the Theater in der Josefstadt were forced to clean toilets of the SA. The process of Aryanisation began, and Jews were driven out of public life within months. These events reached a climax in the Kristallnacht pogrom of 9–10 November 1938. All synagogues and prayer houses in Vienna were destroyed. The Stadttempel was the sole survivor due to its location in a residential district which prevented it from being burned down. Most Jewish shops were plundered and closed. Over 6,000 Jews were arrested overnight, the majority deported to Dachau concentration camp in the following days. The Nuremberg Laws applied in Austria from May 1938, later reinforced with innumerable anti-Semitic decrees. Jews were gradually robbed of their freedoms, blocked from almost all professions, shut out of schools and universities, and forced to wear the Yellow badge from September 1941. The Nazis dissolved Jewish organisations and institutions, hoping to force Jews to emigrate. Their plans succeeded—by the end of 1941, 130,000 Jews had left Vienna, 30,000 of whom went to the United States. They left behind all of their property, but were forced to pay the Reich Flight Tax, a tax on all émigrés from the Third Reich; some received financial support from international aid organisations so that they could pay this tax. 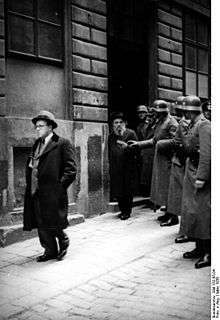 Following the Wannsee Conference in January 1942, where the Nazis resolved to completely annihilate the Jewish population, the majority of the Jews who had stayed in Vienna became victims of the Holocaust. Of the more than 65,000 Viennese Jews who were deported to concentration camps, little more than 2,000 survived. While historians concur that the votes were accurately counted, the process was neither free nor secret. Officials were present directly beside the voting booths and received the voting ballot by hand (in contrast to a secret vote where the voting ballot is inserted into a closed box). In some remote areas of Austria, people voted to preserve the independence of Austria on 13 March (in Schuschnigg's planned but cancelled plebiscite) despite the Wehrmacht's presence. For instance, in the village of Innervillgraten, a majority of 95% voted for Austria's independence. 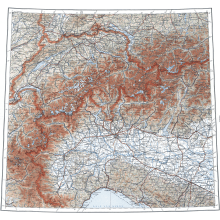 However, in the plebiscite on 10 April, 73.3% of votes in Innervillgraten were in favor of the Anschluss, which was still the lowest number of all Austrian municipalities. A largely unhindered vote occurred in the Italian harbour city of Gaeta, where an extraterritorial vote of Austrian clerics studying at the German college of Santa Maria dell'Anima took place. The vote was concluded on board the German cruiser Admiral Scheer, anchored in the harbour. Contrary to the nationwide result, this vote rejected the Anschluss by over 90%, an event that was later called the "Shame of Gaeta" (Vergogna di Gaeta, Schande von Gaeta). Austria remained part of Germany until the end of World War II. 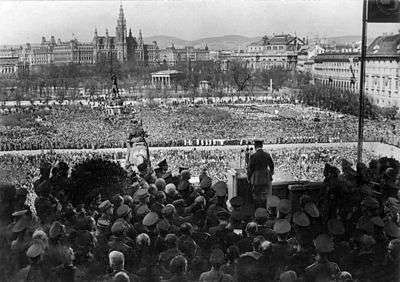 A provisional Austrian government declared the Anschluss null und nichtig (null and void) on 27 April 1945. Henceforth, Austria was recognized as a separate country, although it remained divided and controlled by the Allied Commission until 1955, when the Austrian State Treaty restored its sovereignty. Austria in the first days of the Third Reich had many contradictions: at one and the same time, Hitler's regime began to tighten its grip in every aspect of society, beginning with mass arrests as thousands of Austrians tried to escape; yet other Austrians cheered and welcomed the German troops entering their territory. 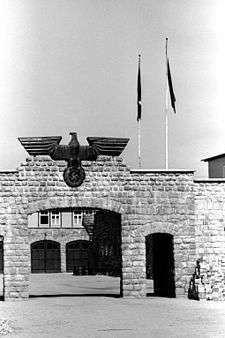 A large concentration camp was quickly established at Mauthausen-Gusen, and became notorious for its cruelty and barbarism. Many victims died during their work in the nearby quarry. His Majesty's Government have throughout been in the closest touch with the situation. The Foreign Secretary saw the German Foreign Minister on the 10th of March and addressed to him a grave warning on the Austrian situation and upon what appeared to be the policy of the German Government in regard to it. ... Late on the 11th of March our Ambassador in Berlin registered a protest in strong terms with the German Government against such use of coercion, backed by force, against an independent State in order to create a situation incompatible with its national independence. I imagine that according to the temperament of the individual the events which are in our minds to-day will be the cause of regret, of sorrow, perhaps of indignation. They cannot be regarded by His Majesty's Government with indifference or equanimity. They are bound to have effects which cannot yet be measured. The immediate result must be to intensify the sense of uncertainty and insecurity in Europe. Unfortunately, while the policy of appeasement would lead to a relaxation of the economic pressure under which many countries are suffering to-day, what has just occurred must inevitably retard economic recovery and, indeed, increased care will be required to ensure that marked deterioration does not set in. This is not a moment for hasty decisions or for careless words. We must consider the new situation quickly, but with cool judgement.... As regards our defence programmes, we have always made it clear that they were flexible and that they would have to be reviewed from time to time in the light of any development in the international situation. It would be idle to pretend that recent events do not constitute a change of the kind that we had in mind. Accordingly we have decided to make a fresh review, and in due course we shall announce what further steps we may think it necessary to take. Within this speech Chamberlain also said, "The hard fact is that nothing could have arrested what has actually happened [in Austria] unless this country and other countries had been prepared to use force." Germany, which had a shortage of steel and a weak balance of payments, gained iron ore mines in the Erzberg and 748 million RM in the Austrian National Bank's reserves, more than twice its own cash. The subdued reaction to the Anschluss (the U.S. issued a similar statement) led to Hitler's conclusion that he could use more aggressive tactics in his "roadmap" to expand the Third Reich, as he would later do in annexing the Sudetenland. The word Anschluss is properly translated as "joinder," "connection," "unification," or "political union." In contrast, the German word Annektierung (military annexation) was not, and is not commonly used now, to describe the union of Austria and Germany in 1938. The word Anschluss had been widespread before 1938 describing an incorporation of Austria into Germany. Calling the incorporation of Austria into Germany an "Anschluss," that is a "unification" or "joinder," was also part of the propaganda used in 1938 by Germany to create the impression that the union was not coerced. Hitler described the incorporation of Austria as a Heimkehr, a return to its original home. The word Anschluss has endured since 1938, despite being a euphemism for what took place. After World War II many Austrians sought comfort in the idea of Austria as "the Nazis' first victim." Although the Nazi party was promptly banned, Austria did not have the same thorough process of denazification that was imposed on Germany. Lacking outside pressure for political reform, factions of Austrian society tried for a long time to advance the view that the Anschluss was only an annexation at the point of a bayonet. It has also helped the Austrians develop their own national identity as before. After World War II and the fall of the Third Reich the political ideology of Pan-Germanism fell into disfavor and is now seen by the majority of German-speaking people as taboo. Unlike earlier in the 20th century when there was no Austrian identity separate from a German one, in 1987 only 6 percent of the Austrians identified themselves as "Germans." Today over 90 percent of the Austrians see themselves as their own nationality. The existence of an independent Austrian state is no longer questioned as it was in the inter-war period. For decades, the victim theory remained largely undisputed in Austria. The public was rarely forced to confront the legacy of the Third Reich. One of those occasions arose in 1965, when Taras Borodajkewycz, a professor of economic history, made anti-Semitic remarks following the death of Ernst Kirchweger, a concentration camp survivor killed by a right-wing protester during riots. It was not until the 1980s that Austrians confronted their mixed past on a large scale. The catalyst for the Vergangenheitsbewältigung (struggle to come to terms with the past) was the Waldheim affair. Kurt Waldheim, a candidate in the presidential election and former UN Secretary-General, was accused of having been a member of the Nazi party and of the infamous SA (he was later absolved of direct involvement in war crimes). The Waldheim affair started the first serious discussions about Austria's past and the Anschluss. I personally would like to know why the WJC has hardly put any pressure on Austria, even as leading Nazis and SS leaders were Austrians, Hitler included... Immediately after the war, the US wanted to make the Russians withdraw from Austria, and the Russians wanted to keep Austria neutral, therefore there was a common interest to grant Austria victim status. And later Austria could cry poor – though its per capita income is as high as Germany's. And, most importantly, the Austrian PR machinery works better. Austria has the opera ball, the imperial castle, Mozartkugeln [a chocolate]. Americans like that. And Austrians invest and export relatively little to the US, therefore they are less vulnerable to blackmail. In the meantime, they set up a commission in Austria to clarify what happened to Jewish property. Viktor Klima, the former chancellor, has asked me to join. My father fought for Austria in the First World War and in 1939 he was kicked out of Austria. After the war they offered him ten dollars per month as compensation. For this reason I told Klima, no thank you, this makes me sick. In 2003, the Center launched a worldwide effort named "Operation: Last Chance" in order to collect further information about those Nazis still alive that are potentially subject to prosecution. Although reports issued shortly thereafter credited Austria for initiating large-scale investigations, there has been one case where criticism of Austrian authorities arose recently: The Center has put 92-year-old Croatian Milivoj Asner on its 2005 top ten list. Asner fled to Austria in 2004 after Croatia announced it would start investigations in the case of war crimes he may have been involved in. In response to objections about Asner's continued freedom, Austria's federal government has deferred to either extradition requests from Croatia or prosecutorial actions from Klagenfurt, neither of which appears forthcoming (as of June 2005). Extradition is not an option since Asner also holds Austrian citizenship, having lived in the country from 1946 to 1991. ↑ After the Prussian-dominated German nation-state was created in 1871 without Austria the German question was still very much active in most parts of Austria in the Austria-Hungary empire, the Austrian pan-Germans were in favour of a Pan-Germanism vision of Austria joining Germany to create a "Greater Germany". ↑ Alfred D. Low (1974). 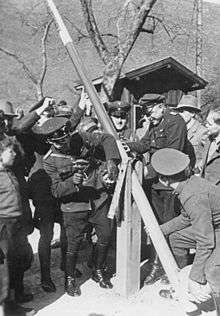 The Anschluss Movement, 1918–1919: And the Paris Peace Conference. American Philosophical Society. pp. 3–. ISBN 978-0-87169-103-3. ↑ William L. Shirer (1984). Twentieth Century Journey, Volume 2, The Nightmare Years: 1930–1940. Boston: Little, Brown & Company. ISBN 0-316-78703-5. 1 2 3 "Hitler Triumphant: Early Diplomatic Triumphs". ↑ James J. Sheehan (1993). German History, 1770–1866. Oxford University Press. p. 851. ↑ Adolf Hitler (June 2010). Mein Kampf. Bottom of the Hill. ISBN 978-1-935785-07-1. 1 2 Gunther, John (1936). Inside Europe. Harper & Brothers. pp. 284–285, 317–318. ↑ Albert Speer recalled the Austrians cheering approval as cars of Germans entered what had once been an independent Austria. Speer (1997). Inside the Third Reich, p. 109. ↑ Surprised or not, Hitler’s schoolboy dream of a "greater Germany" had come to fruition when Austria was incorporated into the Reich. Ozment (2005). A Mighty Fortress: A New History of the German People, p. 274. 1 2 MacDonogh, Giles (2009). 1938. Basic Books. pp. 35–36. ISBN 978-0-465-02012-6. ↑ Hildebrand (1973). The Foreign Policy of the Third Reich, pp. 60-61. ↑ Neville Chamberlain, "Statement of the Prime Minister in the House of Commons, 14 March 1938." ↑ William L. Shirer (1984). Twentieth Century Journey, Volume 2, The Nightmare Years: 1930–1940. Boston: Little Brown and Company. p. 308. ISBN 0-316-78703-5. ↑ The Moscow Declaration on Austria, 30 October 1943. ↑ Steininger, Wolf: Austria, Germany, and the Cold War: From the Anschluss to the State Treaty 1938–1955. Berghahn Books, New York, NY 2008, ISBN 978-1-84545-326-8, contents pdf. ↑ Art, David: The Politics of the Nazi Past in Germany and Austria. Cambridge University Press, 2006, ISBN 978-0-521-85683-6. ↑ Liukkonen, Petri. "Thomas Bernhard". Books and Writers (kirjasto.sci.fi). Finland: Kuusankoski Public Library. Archived from the original on 10 February 2015. ↑ Efraim Zuroff, "Worldwide Investigation and Prosecution of Nazi War Criminals, 2001–2002," Simon Wiesenthal Center, Jerusalem (April 2002). ↑ "Take action against Nazi war criminal Milivoj Asner," World Jewish Congress, 19 November 2004. ↑ "Mutmaßlicher Kriegsverbrecher Asner wird nicht an Zagreb ausgeliefert" (in German). Der Standard. 26 September 2005. Retrieved 17 February 2013. (German) Scheuch, Manfred (2005). Der Weg zum Heldenplatz: eine Geschichte der österreichischen Diktatur. 1933–1938. ISBN 3-8258-7712-4. (German) Stuckel, Eva-Maria (2001). Österreich, Monarchie, Operette, und Anschluss: Antisemtismus, Faschismus, und Nationalsozialismus im Fadenkreuz von Ingeborg Bachman und Elias Canetti. Kulturfoerderverein Ruhrg. ISBN 3-931300-09-9. Österreichs Weg zum Anschluss im März 1938," Wiener Zeitung, 25 May 1998 (detailed article on the events of the Anschluss, in German).